NEW YORK, NY – Cinionic, a global leader in cinema technology, has partnered with the Film Expo Group to become the Official Projection Partner at CineEurope for the second year in a row. All projection equipment in the CCIB Auditorium will be supplied by Cinionic, including the laser projectors for all studio product presentations and screenings. 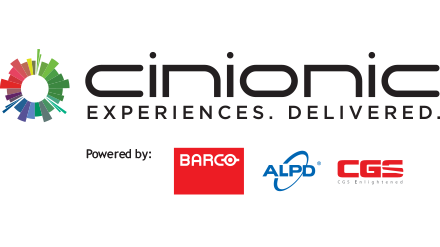 Cinionic is a joint venture among Barco, Appotronics, and CFG, with offices in the United States, Belgium, Hong Kong and Mexico. Visit www.cinionic.com, follow us on Twitter (@Cinionic), LinkedIn (Cinionic), YouTube (CinionicTV), or like us on Facebook (Cinionic).